Great news: You can definitely prepare for this part of the TOEFL. Set a goal of doing one or two practice essays each week. You will notice your essays improve. You can test your skills with Integrated practice test questions online, or even make your own practice test by using passages from books and free lectures online. Practice your listening skills daily. You can do this by listening to podcasts, and the best English podcast to start with is EnglishClass101 by Innovative Language. It is designed for English students at all skill levels, from beginner to advanced, and it can help you improve your listening in an easy, friendly way. Get real-world English experience with FluentU. You’ll get to hear English as it’s spoken by native speakers! Read current events about major topics in Life Sciences, Social Sciences, Physical Science and Humanities. There are sites on these subjects that are made for English language learners, like Discovery Earth. Sites like this are great resources for learning about common TOEFL topics. Of course, you can never guess exactly what topic you will get on the day of the TOEFL, but at least you will get plenty of reading practice! Take a full, scored practice exam. Don’t just take a practice exam at home, alone. Take a full practice exam that gives you a real score and feedback from TOEFL-certified educators instead. Find a TOEFL tutor. If you would prefer to meet with a tutor online in your free time, then start looking for TOEFL tutors on Verbling. If you would prefer to meet your TOEFL tutor in person, then look on Wyzant—there are even tutors on Wyzant who have a specialization in teaching English writing, so look for these tutors if you need essay help more than anything else. Finally, after all your preparation…it’s test day! Start by finding the shared topic of the reading and listening passages. The topic is the general idea that is found throughout the passages, and will be just a few words. To find it, look (or listen) for repeated words and ideas throughout the passages. What do you think the topic of this passage is? Lemon, strawberry, chocolate…no matter what the flavor, birthday cake has been a tradition for thousands of years. Often decorated with flowers or candles, birthday cake is an important part of any birthday celebration. Answer? Birthday cake. These repeated words are the most general idea throughout the paragraph! Ask yourself, “What is the author or speaker saying about the topic?” The answer to this question is your claim. Often, you will hear the claim after a brief introduction to the topic. Can you find the claim in this example? Remember, it’s the author’s main point about the topic (birthday cake). Often decorated with flowers or candles, birthday cake is an important part of a birthday celebration for a few reasons. First, it helps the birthday person feel special. It also provides a fun activity for the party and a way for each guest to be included in the celebration. Answer? It’s in the first sentence: “Birthday cake is an important part of a birthday celebration.” That’s the author’s main point: their claim that they are proving. If you need some extra practice identifying topics and details, check out this free interactive lesson. Next, listen or read for reasons that explain or prove the claim in both the reading and listening passages. These may be examples, facts or other details. If you are starting to feel lost, don’t panic! Listen for addition transitions like “next,” “also” and “furthermore.” These transitions give you a clue that important details are coming! Let’s look at our example again. This time, let’s find the reasons that the author believes birthday cake is so important. Don’t forget, those transition words give you clues to find the reasons! Birthday cake makes the birthday person feel special. It provides a fun activity for the party. It provides a way for each guest to be included. Tip: Some students find it helpful to note the topic, claim and reasons (using their own numbering system or symbols) as they are reading or listening. This way, they are able to easily organize their essay later. But don’t try to write down every word you hear! Just note the topic, claim and reasons as best as you can. You will want to write your essay in your own words, anyway. The goal of the TOEFL Integrated essay is to consider how the reading and listening passages connect to each other. Take a look at the claims that you identified in the reading and listening passages. Do they agree or disagree? Take a look at these two claims. Do you think they agree or disagree? Claim #1: Birthday cake is a positive tradition because it helps people celebrate with family and friends. Claim #2: Birthday cake is a negative tradition because people should be able to celebrate their birthdays with whatever dessert they like, not just birthday cakes. Answer? These two claims disagree. There are two options to organize your essay: block style or point by point. For a block style essay, you start with an introduction that explains the connection between the reading and listening lecture. Then, you combine all of the points from the reading in one paragraph, and combine all of the points from the listening in another paragraph. This is an especially good option if you had a hard time understanding some of the details in the reading or listening passages (or both). How could you organize these ideas in a block style? Reading Claim: Birthday cake is a positive tradition because it helps people celebrate with family and friends. Listening Claim: Birthday cake is a negative tradition because people should be able to celebrate their birthdays with whatever dessert they like, not just birthday cakes. Answer? For block style, just make two paragraphs! Put all of the ideas from the reading in the first paragraph, and all of the ideas from the listening in the second one. In this case, the first paragraph would talk about birthday cake being a positive tradition, and the second would talk about it being negative. This type of organization starts out similar to block style, with an introduction explaining the relationship between the claims. But instead of separating the reading and listening in blocks, each paragraph is organized around a single point. The reading and listening are connected through the detail that they share. This type of organization shows a deeper understanding of the reading and listening lecture. How could you organize these ideas in a point by point style? Reading’s Claim: Birthday cake is a positive tradition because it helps people celebrate with family and friends. Listening’s Claim: Birthday cake is a negative tradition because people should be able to celebrate their birthdays with whatever dessert they like, not just birthday cakes. Answer? For a point by point essay, you would have a paragraph focused on “Celebrations.” Here, you would explain the detail in both the reading passage (people should celebrate by having birthday cake with family and friends) and the listening passage (people should celebrate in whatever way they choose). Okay, so you have identified the topic, claim and details. You have decided which type of organization to use. Now, how do you write the essay? First, use your transition words. A transition shows the reader how your sentences are related to each other. These words are often at the beginnings of sentences. Paraphrasing (or restating the ideas in your own words) is key for high scores! Check out the official TOEFL Writing Rubrics to see how important paraphrasing is. Try to avoid using the exact same words, phrasing or idioms as the reading or listening passage. Learn lots of sentence structures and verb forms. Remember, you will get a chance to share your own opinion in the TOEFL Independent essay. For the Integrated essay, you want to stick to the points that you have heard or read. Don’t add any of your own opinions, even in the conclusion paragraph. This essay is all about understanding the connection between the reading and the listening passages, and restating it in your own words as much as you can. 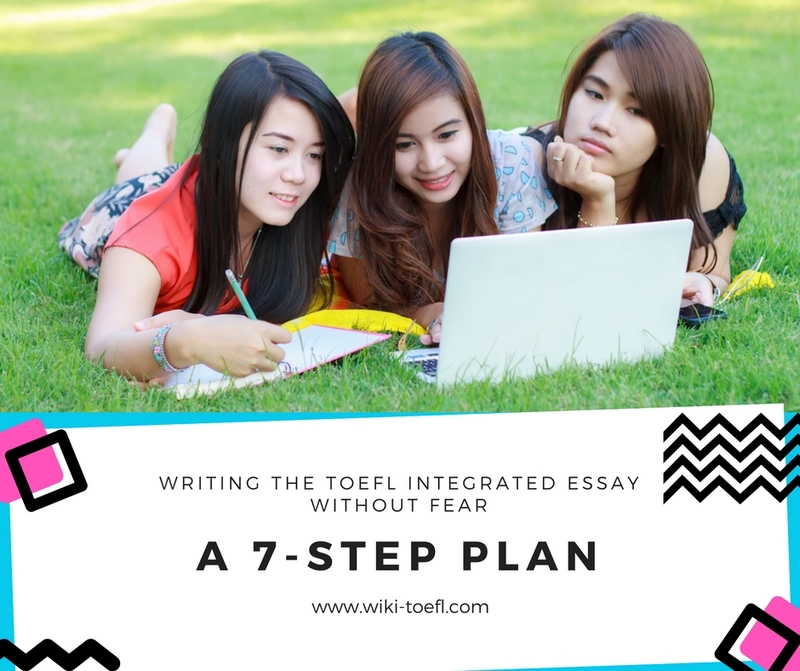 So when it’s time to take out your pencil and start the TOEFL Integrated essay, write with confidence.